The Billionty-Oneth Geek: Entering District 9!!!!!!!!!! So this movie basically ruled. Finally, after a summer of cinema crappiness comes a great movie. It's too easy to spoil plot elements from this movie, so I'll keep the story as bare boned as possible. So about 20 years ago, an alien mother ship broke down on Earth and of all places, came to a halt right above Johannesburg, South Africa. 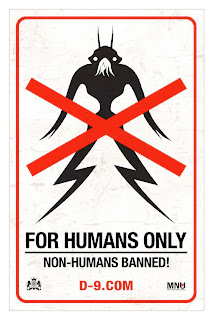 The alien colony settled in an area of the city called District 9, monitored by the government. 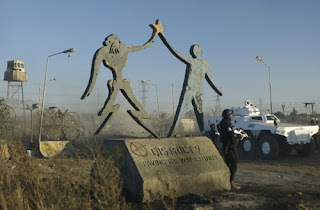 After years of occupation, D-9 became a slum, and a group named Multinational United (MNU), were hired to move the 1.8 million inhabitants to a place called District 10, several kilometers away from Johannesburg. The movie follows a field operative named Wikus who becomes the leader of this eviction program. On a routine operation, Wikus becomes infected from an alien substance he finds from one of the slum's huts. The rest of the movie follows Wikus as he discovers what he's infected with and as he seeks a cure for his disease with the help from some aliens. A monument depicting the peace between aliens and humans. What's unique about the movie is that the first third of it is shot in a documentary style; using clips from interviews, news footage and CCTV cameras. The subject of the documentary is on Wikus, where they speak of him in such a manner that alludes us to something grave that may have happened to him. In all the interviews they do, they speak of Wikus in a past tense, which was a great way of building up the mystery and the eventual reveal. The movie then switches gears and becomes more of an action movie. Shooting with the shaky cam with South Africa as the backdrop really gave it a raw and rugged edge, a very visceral style. It felt like we were right there with Wickus in the middle of the action. It also helped that all the kills within the movie were so gory. I am a gore hound, I don't hide it. I loved all the exploding bodies and flying heads. Still, in the end, it was the documentary portion of the movie that had me gripped. It was a very original way of setting up the action portion of the movie. I also liked how they left it open for a sequel, with a few unresolved plot points and even the mentions of District 10. The movie was directed by a young and relatively new director named Neill Blomkamp. This was his first major feature and quite a success. That he was able to make this movie on a $30 million budget is another impressive thing about the movie. In its first weekend, it already recouped its cost, so that can only be good news towards a hopeful sequel. The film was produced by Peter Jackson's Wingnut Studios. I only bring this up because Blomkamp and Jackson were originally attached to Microsoft's Halo movie. In fact, Blomkamp directed a short movie to show what his Halo would of looked like. I'm not sure of the facts, but the two sides eventually went their own ways. Microsoft even turned down Steven Spielberg who was interested in the movie. You know something's awry when you turn down someone like Spielberg. Anyhow, this was a great movie. If you haven't already seen it, do yourself a favour and go see it. I've also attached the Halo short film below for your viewing pleasure. The style is almost the same as District 9, which is not a bad thing at all.